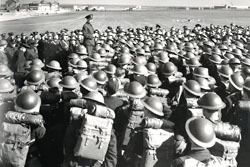 Air Vice-Marshal Albert Godfrey addresses personnel during a 1943 inspection at Gander, Nfld. Albert Earl Godfrey was a remarkable Royal Canadian Air Force officer, proud of two accomplishments above all else. One was having held, from 1910 to 1944, virtually every rank from bugler to air vice-marshal; the other was that of being the most senior Canadian officer to fire directly on the enemy during World War II. Friendly and popular, Godfrey always looked a few years older than his real age, and was affectionately known as Father Godfrey. His democratic attitude was engendered by experience. Godfrey was born in Killarney, Man., on July 27, 1890, but raised in Vancouver where he became a gunsmith, dabbled in building an airplane—which he never flew—raced motorcycles and in 1904 joined the local militia unit, the Duke of Connaught’s Own Rifles, as a drummer and bugler. He was a sergeant in the militia when WW I began, went overseas with the Canadian Mounted Rifles, then switched to the Pioneer Corps. He was considered an expert with machine-guns, although most of his suggested improvements were considered too complicated to be practical. Godfrey had joined the army in spite of pre-war contacts with aviation, including the friendship of pioneers William Stark and William Templeton. In July 1916, having experienced land warfare in France, he transferred from the Canadian Expeditionary Force to the Royal Flying Corps. He flew as an observer with No.10 Squadron (BE.2c aircraft, army co-operation duties), then in No. 25 Sqdn. (FE.2b fighters). As a gunner he sat in the forward nacelle of the FE.2b with a clear field of fire at enemy aircraft. On Oct. 16, 1916, he engaged a Roland D fighter and sent it down “out of control”—a vague term used in Royal Flying Communiqués indicating that the opponent had been forced away from its duties and might have crashed, even if its destruction was unconfirmed. No. 25 Sqdn. also had varied duties, including ground attacks. In December 1916, he was posted to England, trained as a pilot and then returned to France in May 1917. Flying Nieuport 17s with No. 40 Sqdn., he destroyed at least four enemy aircraft, was credited with sending down nine “out of control” and earned the Military Cross. The Nieuport 17, most often associated with Billy Bishop VC, was a peculiar fighter. Having no synchronization gear to allow direct fire through the propeller arc, its normal armament was a Lewis machine-gun attached to the upper wing and accessible through a sliding rail. It was easier to attack an opponent from below and to the rear than from directly behind. Once emptied, the ammunition drum was changed manually—often in the middle of a fight. With his genius for armament, Godfrey managed to fit two machine-guns to his Nieuport, although changing drums was still a hazardous task. Combats were confused affairs. During one of his earliest sorties—on June 1, 1917—he climbed to 13,500 feet to attack two enemy aircraft, fired 80 rounds, and saw no results. Both machines dived away. Minutes later he attacked an Aviatik observation aircraft from below at a range of only 25 yards. He emptied half a drum of bullets into the target, saw his tracers hit, and watched as it stalled and dived steeply. Infantry reports later confirmed its destruction. Godfrey attributed his success to his knowledge of his tools. He had taken five weapons courses before reaching a combat unit, looked after his own machine-guns, and never had a stoppage in the air, either through faulty ammunition or mechanical failure. In his view, observers and pilots should almost live with their guns until their handling and operation become second nature. During his time at No. 40 Sqdn. he served with several remarkable men. Lieutenant Edward Mannock was destined for fame, a VC and a tragic death. John Henry Tudhope, born in South Africa, would become another “ace.” He would later migrate to Canada and make a valuable contribution to commercial aviation. From September 1917 to April 1918, Godfrey flew with Nos. 44, 143 and 78 (Home Defence) squadrons, operating Sopwith Camels in futile attempts to intercept nocturnal German bombers. These entailed two-hour sorties flown in pitch darkness relying on blind luck to find a target. “During all my night flying I never saw a Hun machine,” he later wrote. He did, however, have a novel idea about how night raiders should be intercepted. He suggested that rather than having London blacked out, the city should be illuminated so that bombers would be silhouetted and evident to fighters patrolling higher up! Several years later, while commanding the Air Board station at Jericho Beach, B.C., he tested his theory with aircraft flying over Vancouver at night, and concluded that he had been correct. In the spring of 1918, Godfrey was posted to Canada, first as an instructor, then assuming command of No.1 Sqdn., School of Aerial Fighting at Beamsville, Ont. He was promoted to major in September 1918 and made chief instructor of the whole school. The School of Aerial Fighting was a very large establishment, with roughly 100 JN-4 trainers, one Camel, and one Avro 504 (a type that would have supplanted the JN-4s had the war continued). It was a finishing school for aircrew trained in Canada. Cadets arrived with some 30 hours aerial experience and were taught bombing, gunnery and air fighting tactics for about 10 hours before being shipped overseas. Preparations for winter training were cut short by the Armistice. Just after the Armistice, the school was visited by Brigadier C.G. Hoare, the British officer in charge of all RAF training in Canada. He had never seen Niagara Falls, some 40 miles distant and asked Godfrey to fly him over the cataract. They used the Avro 504, cruising over at 3,000 feet. Hoare banged on the fuselage and motioned for a descent; Godfrey dropped to 2,000 feet, then 1,000 feet, but his superior still seemed dissatisfied with the view. Finally, Godfrey circled near the head of the falls, put the nose down, and dived into the gorge, sailing under the Honeymoon Bridge (located where the Rainbow Bridge now stands) before being trapped in the gorge by eddies and downdrafts. The Avro shuddered on the edge of a stall; it was a stunt that had been forbidden to cadets. Following the war, Godfrey invested in a small private aviation company in Vancouver. He was regarded as a skilled aero engine mechanic, and might have become just another “barnstormer.” However, officers responsible for creating a Canadian Air Force persuaded him to join the CAF in January 1922. He received some refresher flying training at Camp Borden in Ontario, and plans were afoot for him to command that station. However, in September 1922, Sqdn. Ldr. Clare McLaurin, the commanding officer at Jericho Beach, died in a flying accident. Godfrey was appointed to succeed him. His remarkable RCAF career was underway. Even while commanding the Vancouver air station, he played with the idea of offering free flights to the public in order to “sell” aviation and its applications. He proposed to fit a JN-4 with floats for that purpose. Variations of that assessment, “More suitable for command than for work in an office”, were repeated by several superiors during his career. Nevertheless, Godfrey left his mark, often in surprising ways. Soon after his return to Canada, he was tapped to accompany a wealthy American, James D. McKee, on a flight in a Douglas OZB-5 seaplane from Montreal to Vancouver. 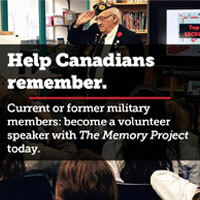 They were welcomed at Ontario Provincial Air Services and RCAF air bases across the country. The two longest legs, Lac du Bonnet, Man., to Prince Albert, Sask., and Lake Wabumun, near Edmonton, to Vancouver each entailed more than seven hours flying. Shortly afterwards, McKee created a trophy to be awarded annually to the Canadian who contributed most to aviation in the preceding year. Formally designated the Trans-Canada Trophy, it was better known as the McKee Trophy. Unhappily, McKee never had the opportunity to present the trophy to any candidate; he was killed in a flying accident in June 1927. Godfrey attended his funeral. Still a squadron leader, Godfrey undertook another lengthy flight (Ottawa to Vancouver) in September 1928, this time accompanied by Warrant Officer M. Graham in a Fairchild FC2W seaplane. Compared to the expedition with McKee (which had taken nine days in 11 hops), this was a speedy flight—three days, five hops, including a non-stop flight from Ottawa to Lac du Bonnet, a distance of 1,100 miles. A few days later, while flying over northern Alberta, Godfrey ran into thick smoke from a number of forest fires. He lost his way and then crashed while attempting a forced landing. Luckily, neither he nor his passengers were injured, although they were missing for 12 days. In 1936, Godfrey took command of Station Trenton. By now he had mastered the art of administration, although the austere Croil still regarded him as too easy-going with subordinates for the “maintenance of discipline.” It was conceded, nevertheless, that Godfrey’s men were fully co-operative and efficient. International tensions and RCAF expansion led to promotions and newer tasks; he attained the rank of group captain in 1938 and air commodore in 1939. At various times he commanded the RCAF’s largest training formations (1938-39), Western Air Command (1939-1941), Eastern Air Command (summer of 1941), then Western Air Command again (late 1941). He was then posted back to Ottawa, promoted to air vice-marshal, and in June 1942 appointed deputy inspector-general of the RCAF with special responsibilities for Eastern Canada. In this last role he often piloted an Avro Anson as he checked various bases. On one occasion he landed as the welcoming parade was forming up. A non-commissioned officer approached and shouted, “The CO said to get the hell out of here and take this aircraft, too; we’re expecting the inspector-general.” Godfrey (who was wearing ordinary flying clothes) asked where he was to park. “I don’t know—he didn’t tell me that,” was the reply. “Maybe I’d better leave it here,” Godfrey suggested. That upset his one-man reception committee terribly. Finally, Godfrey climbed out of the Anson, followed by his aide; he removed his flying helmet, put on his service cap replete with “scrambled egg” and strolled over to inspect the parade. By sheer coincidence, he was visiting Station Gander on Sept. 22, 1943, when No.10 (Bomber Reconnaissance) Sqdn. was engaged in sustained coverage of an east-bound convoy which was under intense U-boat attack. The deputy inspector-general decided to “inspect” at first hand, taking up the role of waist gunner in a Liberator. Flight Lieutenant J.F. Green was his chosen captain. The bomber crew, following up a radar contact, spotted their first U-boat in the dawn light. It escaped into fog and probably submerged. The next six hours were uneventful, although the very presence of the Liberator inhibited submarine operations. At last they found another enemy vessel. This one, U-422, chose to fight on the surface and Godfrey hammered away with a .50-calibre gun, becoming the most senior RCAF officer to fire on the enemy during the war. After 27 minutes, the submarine dived. Green dropped two acoustic homing torpedoes (which malfunctioned) before returning to base. U-422, en route home with wounded aboard, was sunk 17 days later by aircraft from the USS Card. When the role of inspector-general was abolished (together with the two deputy posts), Godfrey retired in June 1944 to Gananoque, Ont., where he indulged in luxurious boating. Curiously, he received no awards for his WW II service, although other senior officers were created Commanders of the Order of the British Empire or Companions of the Order of the Bath. Perhaps Godfrey’s peculiar politics were held against him—he ran for Parliament as a Co-operative Commonwealth Federation candidate in 1945. On the other hand, by retiring early to seek office he may simply have left the RCAF too soon; honours for senior officers cascaded down immediately following VE-Day. In any case, the last formal honour granted him was the McKee Trophy, presented in 1977 at the 50th anniversary of this prestigious award. He died Jan. 2, 1982, in Kingston, Ont. His papers were subsequently vetted by his family and then deposited with the RCAF Memorial Museum in Trenton, to await a biographer to undertake a full-scale study of a fascinating man.